Solar System: Mars. Creation Testifies! Mars is the planet that appears most earth-like. A solid, rocky world, Mars is just over half the size of Earth in diameter. 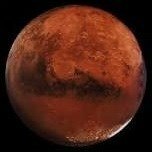 Mars appears as a vivid red star in our night time sky, giving rise to its nickname, the Red Planet. The surface of Mars is composed of oxidized compounds of iron - essentially rust. Its similarities to Earth make it a tempting target for enthusiasts of space colonization; however, the stark differences between the two planets should dampen such enthusiasm. Geologically, Mars has features strikingly comparable to those on Earth. With mountains, valleys, canyons, volcanoes, and polar ice caps, Mars even has some weather similar to Earth's, including seasons, clouds, fog, wind, dust storms, dust devils, and occasional frost. Although liquid water is not found in any abundance on Mars, scientists have discovered substantial quantities of water-ice near the poles and water vapor in the Martian atmosphere. With a thin atmosphere composed mainly of carbon dioxide, Mars does not provide a breathable environment for humans. The axial tilt and rotational period of Mars is much the same as that of Earth. Mars takes 24 hours and 37 minutes to rotate once on its axis - almost identical to Earth. Due to sharing a similar axial tilt to Earth at 25.2 degrees, Mars also experiences four seasons. The orbit of Mars is significantly more elliptical than Earth's, which causes its distance from the sun to change, affecting the severity of its seasons. As a result of this larger orbit, the Martian year equals 1.9 Earth years. Mars has polar ice caps that are visible from Earth using a small telescope. These ice caps grow during the winter in their respective hemispheres and shrink during the summer, just like the ice caps on Earth. But Earth's ice caps are water-ice, and Mars' ice caps are mostly water-ice layered underneath several feet of frozen carbon dioxide (dry ice). Mars is flat, very flat. Most of its surface resembles the deserts we have on Earth, with rocks as far as the eye can see and very little relief. Though there are hills and even enormous mountains, they have gentle slopes that make them seem less magnificent than peaks on Earth. One of Mars' most spectacular features is a canyon called Valles Marineris. It is long enough to reach from one end of the United States to the other and is over 120 miles wide and about four miles deep. For comparison, this is ten times longer, nearly seven times wider, and four times deeper than the Grand Canyon. The two moons of Mars are quite tiny compared to Earth's moon. Phobos is the larger of the two and only about 10 miles in diameter. Since Phobos has so little mass, its gravity is minuscule. Deimos is the other Martian moon and has a diameter of only eight miles. More like two large boulders orbiting Mars, neither Phobos nor Deimos is spherical. This is common with small moons and asteroids since their gravity is insufficient to overcome the chemical bonds that prevent these bodies from collapsing into a spherical shape. This amazing planet has properties that both challenge secular ideas and confirm biblical creation. Mars and Earth possess great similarities but also vast differences. This is yet one more mark of the creativity of the Trinitarian God of Scripture. God Himself (Father, Son, and Holy Spirit) embodies a multitude of characteristics - diverse and yet unified. In the same way, the planets, while not one-and-the-same, have unique variations representing the all-encompassing, endless ingenuity that the Creator exemplifies in all His forms.